Hall of Presidents, The Liberty Square attraction in Magic Kingdom Park at Walt Disney World, opening October 1, 1971. At one time this show had been proposed for Disneyland, under the title of One Nation Under God. 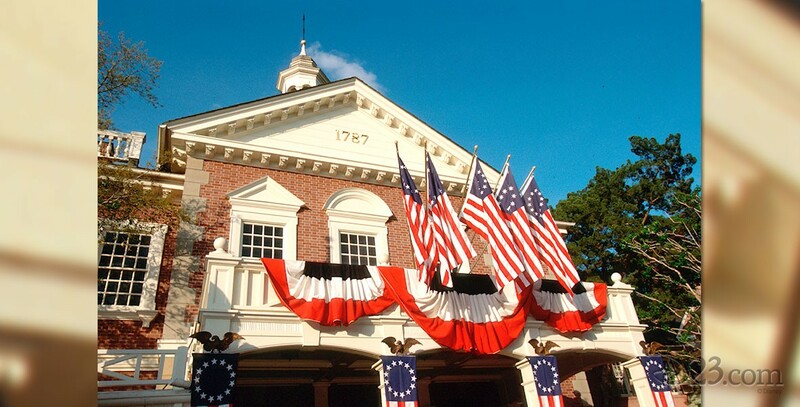 A pre-show film discusses how the Constitution was drafted and how it has had increased significance at various periods of American history from the eighteenth century to the present. The motion picture was shot on 70mm film, using a special system invented by Ub Iwerks to scan the specially produced paintings (some of which are on display in the waiting area), and it is projected on a huge screen. Then the screen parts and all 43 presidents are on stage, represented by Audio-Animatronics figures. Originally, they were all introduced by the narrator, then George Washington sat down and Abraham Lincoln spoke his remarks. Royal Dano provided the original voice of Lincoln. The presidents elected after 1971 were added within a year or so of their elections. When Bill Clinton was added in 1993, the pre-show film and Lincoln speech were shortened, and Clinton made a few remarks. The Clinton speech was actually recorded by the president in the White House. The same was done when George W. Bush and Barack Obama became president. For the presidents, detailed research was done by the Disney designers, to provide not only images that the sculptors could follow in creating the figures themselves, but information on hairstyles, costumes, fabrics, and jewelry. Everything was then reproduced as authentically as possible. Narrators have been Lawrence Dobkin, Maya Angelou, J.D. Hall, and Morgan Freeman.